Rejoice, Mary. Your name will be exalted on this hill of Belmonte by thousands of persons from all parts of the World. Belmonte, September 8th: "Today, the Shrine which belongs to all of us has become a reality"
"Hoy se ha hecho realidad el Santuario de todos nosotros"
"Es ist wirklich unser aller Heiligtum geworden!" Mensaje todavia a descubrir: lamina del cuadro de la MTA, con "heridas" y en un marco de material pobre. Peregrinos de México con una tinaja "guadelupana"
ROME, mkf. On the 8th of September, Cardinal Camilo Ruini blessed the Shrine dedicated to the Mother Thrice Admirable, Queen and Victress of Schoenstatt in Belmonte…Casalotti subdivision…Rome…in the presence of more than 3,000 members and friends of the Schoenstatt Movement and greeting the pilgrims in the name of the Italian Bishops Conference. Along with Cardinal Ruini, 13 cardinals and bishops concelebrated the Holy Eucharist and among them was Bishop Gino Reali, bishop of the diocese to which the Belmonte Shrine belongs; Cardinal Francisco Javier Errázuriz, Archbishop of Santiago, Chile and President of the Latinamerican Bishops Conference; Cardinal Mussa Daud; Bishop Robert Zollitsch, Archbishop of the Diocese of Friburg; and a large number of priests. "Today we solemnly inaugurate the International Schoenstatt Shrine which bears the name ‘Omnia Matri Ecclesiae’: all for Mary who is the Mother of the Church; all for the Church who is the mother of all believers. A Shrine in which and from which the maternal function of Mary is continuously renewed under the title ‘Mater Ter Admirabilis’, ‘Mother Thrice Admirable’". "I am happy! ", exclaims Msgr. Peter Wolf while on the large screen can be seen the image of the Shrine of Light which was formed the night before at St. Peter’s Square. "Today, the Shrine which belongs to all of us has become a reality". It was a happy day, a radiantly sunny day in Belmonte. The faces of the pilgrims radiated joy inspite of the heat and burning sun. "We can imagine that Father Kentenich shares our joy", said Cardinal Ruini in his homily, "who making his own the words of the Archangel Gabriel, exclaims:"Rejoice,Mary", because your name shall be exalted upon this hill of Belmonte by thousands of persons from all parts of the World; because once again all generations will greet you; because your intercession will continue changing the water of life into the wine of grace and will lead to the saving action of your Son Jesus Christ". Punctually (almost), at 4:30 P.M., the entrance procession began. Earlier, the first pilgrims to Belmonte had arrived. For several days before one could find many volunteers (from the Schoenstatt Youth, novices of the Schoenstatt Fathers, and many others) working hard to make everything ready and beautiful for the almost 3,000 pilgrims, members of the Schoenstatt Family and friends coming from more than 30 countries. The day before the dedication, the choreographer from the Ladies of Schoenstatt was instructing her "ballerinas" for the dance to be presented during the serenade on the evening of the 8th: "Now they are human beings, later they will be the treasury of grace which flows throughout the whole world; that is how they have to move in their dance". This sounded like a proclamation of life. With large posters on "Father’s Gate" and at the entrance to the property near the Santa Gemma Parish, notice was given that in Belmonte, after 40 years of waiting, the Blessed Mother would descend to take up her dwelling place. ..The land still looks like a construction site but in proximity to the Shrine, not only the large tent but also the many young people announced that hundreds and hundreds of pilgrims were expected…Upon arriving, the first of them discovered the famous tent-bar "Oasis"—a reunion place for all the persons who were at the German Catholic Encounter in Ulm, the Ecumenical Gathering in Berlin, and wherever there is an important Schoenstatt event or Church gathering. This is an apostolate of the German Youth. It is a huge success for bringing people together as was experienced in the "Search for Footsteps". There are also stands which sell books, CD’S, medals, crosses, and pictures of the MTA. 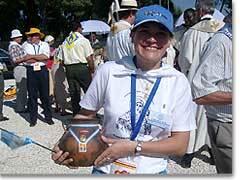 "I want to take something from here to all my Schoenstatt friends", said a lady. "There are not enough rosaries", commented another lady. As such, a half hour before the first pilgrims arrived, the vendors had already depleted their inventory. Before beginning Holy Mass, more and more persons would gather at the podium where they "gathered" the jars. In addition to the Third International Auxiliary Shrine of the Campaign, which was so important in the Vigil procession, there was a Pilgrim Image which was sent from Brazil at the closing of the Centennial Congress of Don Joao, pictures of Don Joao, a bouquet of roses on behalf of Mario Hiriart, a drum and a basket from Burundi…Two young priests from the Institute of the Schoenstatt Diocesan Priests carried the original picture of the MTA for the Shrine which had accidentally fallen and broken the night before. Obviously not only were the frame and picture damaged (this was acquired over 30 years ago by the Girls’ Youth) but also the picture itself was damaged in the fall since half of it was scraped…"The Blessed Mother wants to be one with her suffering Church", commented one of the priests who carried the image. "She wants to share in the suffering of each one of her children." The flags of the countries present in Belmonte headed the entrance procession. It is impossible to describe the quantity and diversity of the different jars which can be seen during the entrance procession. They are transformed into a true parade of love for the Church. There are simple jars, decorated jars, small jars, large jars, jars with the Unity Cross, jars with national logos, jars with flowers, jars with ribbons, jars with rosaries…The Mexicans take a jar with the image of Our Lady of Guadalupe, patroness of the Americas. 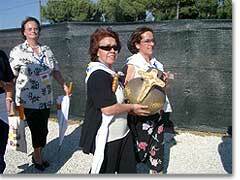 The Professional Women from Germany bring a jar with the Shrine of Dachau for which they are striving. It has stones from the Dachau Concentration Camp, a rosary and a barbed wire around the jar. It contains letters which come from deep suffering and which today become a gift to the Mother of the Church. May my Dachau become a Shrine…All the colorfulness of the Covenant of Love becomes this parade of love for the Church, this international parade of incomparable richness and deep family unity. A choir from Chile excellently set the atmosphere with a cantata to the Mother of the Church. One can perceive a climate of great longing for the arrival of the so much desired moment, not only on behalf of those who were present but also by the large amount of people who from afar had united themselves spiritually for this hour of grace in the blessing of the Shrine of Belmonte. "I do not feel like an invited guest to a party, but like one who is part of the party. It is my party. I also prepared it," commented a lady from Chile. "There are 13 cardinals and bishops in total. I already took note of this," commented the correspondent for the German edition of the "Osservatore Romano" who was present: Cardinal Camilo Ruini as main celebrant and accompanied by Bishop Gino Riali, Bishop of the diocese to which the Shrine of Belmonte belongs; Cardinal Francisco Javier Errázuriz, Archbishop of Santiago, Chile and President of the Latinamerican Bishops Conference, Cardinal Ignace Mussa Daud, patriarch of Antioch and prefect of the Congregation for the eastern Churches, Bishop Robert Zollitsch, Archbishop of the Diocese of Friburg. Attentively the correspondent of the Osservatore Romano takes notes on the context of the blessing of the Shrine as the first step toward the future International Center of Schoenstatt in Rome which was so desired by the Founder and which is taking place today after a long wait of almost 40 years and on the same ground which Father saw and blessed…"At times we were on the brink of abandoning the idea or at least the land," he is told. "We decided to continue waiting and continued insisting on the construction permit. Hardly had we received it when we began the construction of the Shrine, the house of the Mother of the Church. All went very quickly…".To the astonishment of the informant, the correspondent responds: "This is of God. Today, here, what a founder dreamt of for so long is taking place at this precise spot…", in the meantime the singing of 3,000 pilgrims can be heard: "Come, let us go up the Shrine! Come pilgrims from all nations, come to praise the feats of God. Come to give testimony to the action of the Virgin Mary, of the Mother Thrice Admirable, Queen and Victress of Schoenstatt…". Among the symbols especially named and offered were the staffs, symbols of a pilgrim Church; the jars of the Original Shrine, the jars of Bellavista and Milwaukee, and the jar with the names of those who had given their lives for the mission of the Matri Ecclesiae Shrine. Two Chileans in typical dress present the picture of Father Kentenich for the International Center. Also presented is a picture of Blessed Carl Leisner and picture or symbols representing other witnesses to the history of Schoenstatt. There was also a relic of St. Vincent Pallotti, son and apostle of Rome and finally the picture of the MTA for the Shrine which was marked that morning on the feastday of the birth of the Virgin. Fortunately a soft breeze serves as a respite for the pilgrims since the sun shines with intensity and there is almost no shade on the large, almost treeless land. What about the providential scarves with the Schoenstatt logo? The creativity shown at the hour of using them to protect oneself from the sun merits taking note! The multiple models of scarves which were converted into hats, helmets, spacesuits, turbans, neck scarves, shawls etc. could easily be shown in a style show, With warmth and joy, Bishop Gino Reali greeted the pilgrims demonstrating his joy for this new Shrine in his diocese on the Via de Boccea which is one of the ancient roads of pilgrimage to the tombs of Sts. Rufina and Segunda and toward the catacombs. He was also happy to see the realization of the desire of the Schoenstatt Movement to build a Shrine in Rome. To take Schoenstatt to the heart of the Church and to take the Church to the heart of Schoenstatt. The prayers of the Mass, in Latin and Italian, hymns in different languages, plus an atmosphere of joy and of feeling at home, the enthusiasm of so many young people—all of these contributed to this special atmosphere of anticipation and sense of family in this great and sunny land, this international Schoenstatt, this Schoenstatt which belongs to all, in Rome…In his homily, Cardinal Camilo Ruini, with clarity and conviction, referred to the mission of the new Shrine and the significance of this event on the 8th of September. "With the inauguration of the international Shrine, a great mission is entrusted to the Schoenstatt Family: to take Schoenstatt to the heart of the Church and to take the Church to the heart of Schoenstatt. In the first place, to take Schoenstatt to the heart of the Church, that is, to take its charism to the heart of Christianity in order to contribute with its tradition, its pedagogy, its spirituality and to create paths of everyday sanctity and personal models of evangelical radicalism. The theme of this Shrine is:"All for the Mother of the Church". Underlining the "all" motivates us to the totality of the vocation which is proper to the great founders of religious orders such as St. Francis of Assisi, St. Teresa of Avila, and St. Ignatius of Loyola. It brings to mind the vision of Father Kentenich who would often say: All for Schoenstatt, Schoenstatt for the Church, the Church for the Holy Trinity…At the same time, to take the Church to the heart of Schoenstatt. I am sure that you, dear Schoenstatters, will do all that you can so that there where Schoenstatt is, the Church will be present and thus your hopes will be the hopes of the Church. Over the tomb of your dear Founder, Father Kentenich, in the sacristy of the Church of the Holy Trinity are the words: Dilexit Ecclesiam. It would be beautiful if it could be said of each Schoenstatter as faithful disciples of their Founder: he/she loves the Church, loves the Pope, loves the Bishops, loves the Church Institutions, loves the evangelic mission of the Church and who has as a goal the new person in a civilization of love". Thanks to all, in heaven and on earth, for our Shrine!